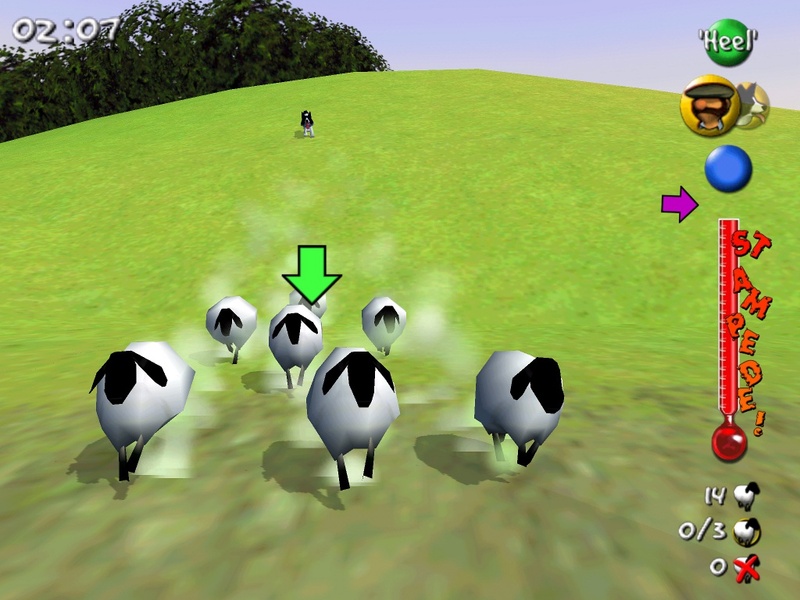 Developed by io productions, the studio that worked with Smoking Gun on soccer management sim Giant Killers, Stampede initially started life as a PC game in which the player takes control of a farmer and his trusty sheep dog. 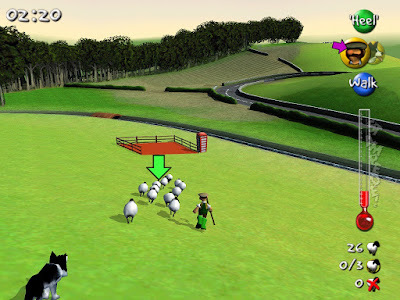 The main aim of the game was to use Farmer Blow's instructions to his dog Shep, carefully corralling sheep (and later other exotic animals) into pens and around stages within a set time limit. The stages initially start as typical English meadows populated by fluffy white sheep, and I dare say the wild popularity of the movie Babe had more than small hand (trotter?) in the formulation of this concept at the time. Later, players move on to much more treacherous locales, with more extravagant quarry - alpine peaks and tropical islands, while elephants and penguins take the place of the docile sheep. 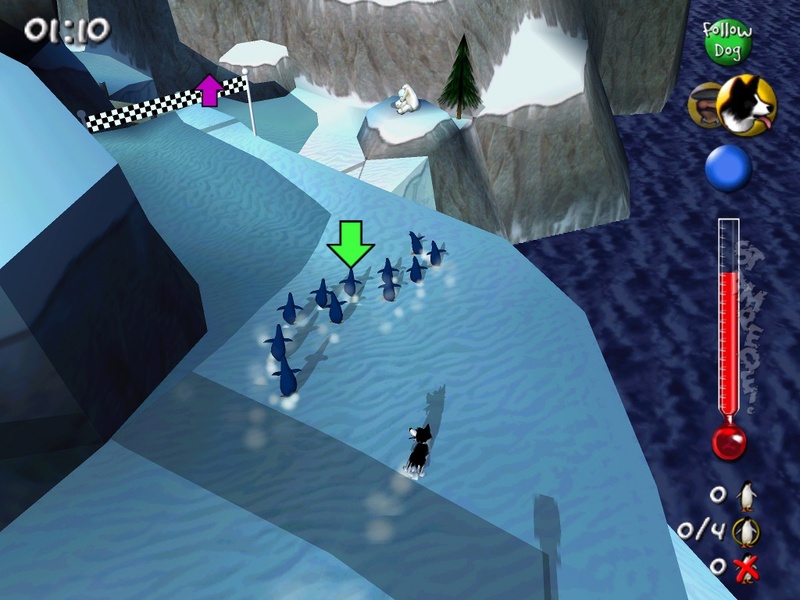 There are also rumours that the game would utilise the Dreamcast's microphone controller so that those with the skills could actually use whistle commands to instruct Shep around the courses. "I remember there was quite a bit of juggling of our concept between departments in Infogrames at the time. The game concept really didn't fit any pre-defined genres, so it's not surprising that the various departments really weren't sure how to place us. For us, though, the end result was that we ended up skewing our game in one direction and then another every few months as another department took a look. "Thinking back now, I'm not too sure we had that definite an idea as to how to get from our initial concept to a full blown game anyway (i.e. 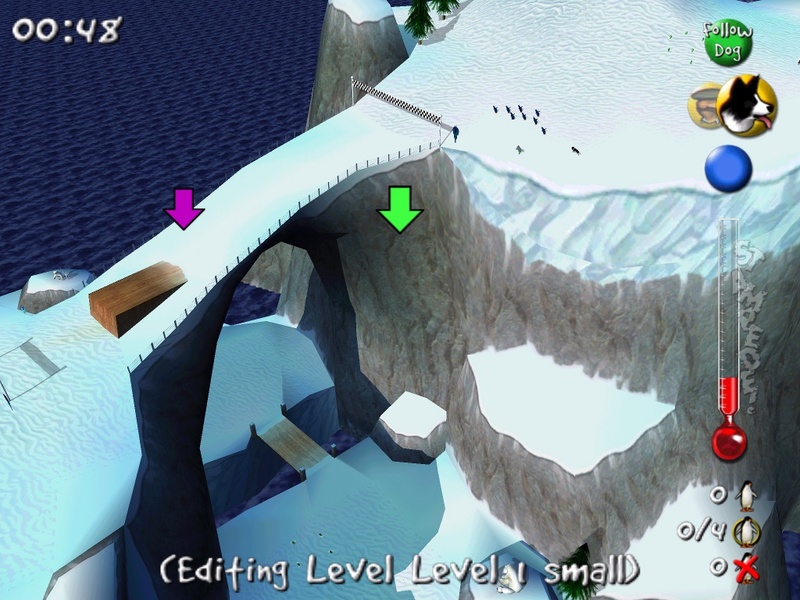 what every level would be, how the difficulty curve would work, what the impetus behind continuing would be for the player, etc. ), so I can see where these suggestions came from." As was the norm back in the late 1990s, anything destined for the PC was also considered for the Sega's console, such was the ease with which PC titles could be ported. However, it seems that while the Dreamcast version of Stampede was well under way, and also featured in the May 2000 issue of UK print magazine Dreamcast Monthly, the game would eventually find its way into the great abattoir in the sky. 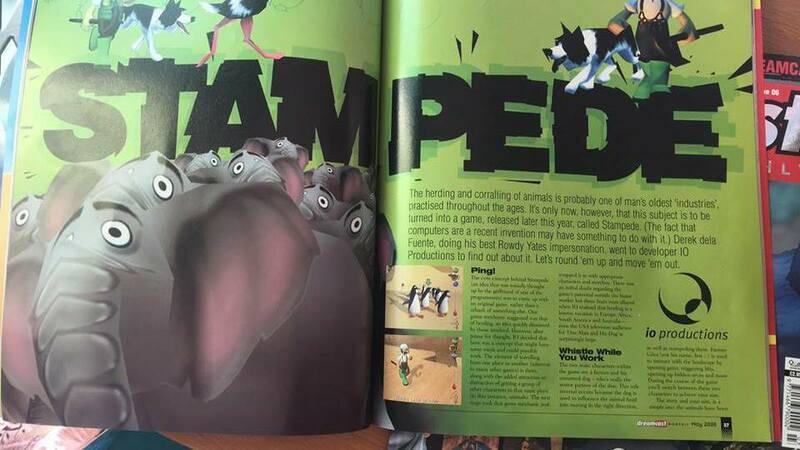 As previously mentioned, an ISO version of Stampede is now known to be in the hands of Bitmap Bureau, incidentally a studio composed of folks who previously worked at io productions, so the future is pretty bright; however we caught up with Glenn Broadway, Creative Director on Stampede to get his side of the story. DCJY: Hi Glenn, thanks for talking to us about the distant past! Can you tell us a little about your role at io productions? Glenn Broadway: I was one of the three co-founders of io productions, along with John Chasey and Andy Bain. We were all at SCi at the time, where I spent my time working with John on PC games. My role was effectively Creative Director. So you were all pretty much veterans at the time io productions came to be. What are your memories of Stampede and where did the idea come from? I believe it was Andy Bain who first suggested a sheep-herding game, possibly at the suggestion of his girlfriend at the time. We quickly all agreed that the idea was good and starting working on concepts. We were working on one other concept at the time, for a turn-based magic based combat game - not dissimilar to Chaos by Julian Gollop (and the new version of Chaos looks great). Can you recall anything about the Dreamcast version of Stampede, how was it running and how complete was it the last time you saw it? Well, the engine was pretty much done and we had a handful of levels created. But realistically there was a long way to go. 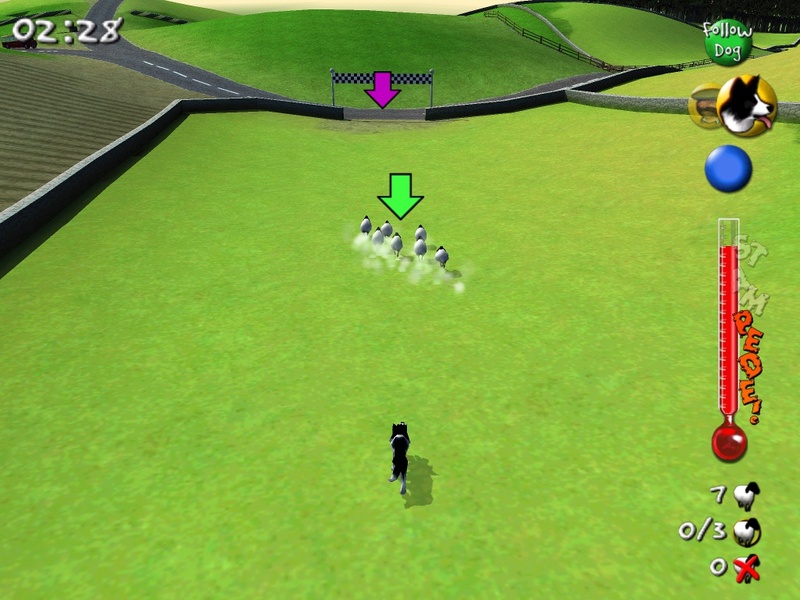 We knew that the gameplay would need a lot of refining and we were really in the early stages of that to be honest. The control system was a constant battle and whilst it was working there was still some way to go. But to answer the question, the game was running on the Dreamcast just fine. That's pretty encouraging considering the current status of the recently found ISO. On that topic, was the Dreamcast a platform you were keen to support? Why bring Stampede to Sega's console rather than PlayStation? I think it was a decision that was led by our publisher, Infogrammes. At the time though, nobody knew who was going to win out - Sony or Sega. And Sega were first to move on from the Playstation/Saturn era, so it was timing as well. 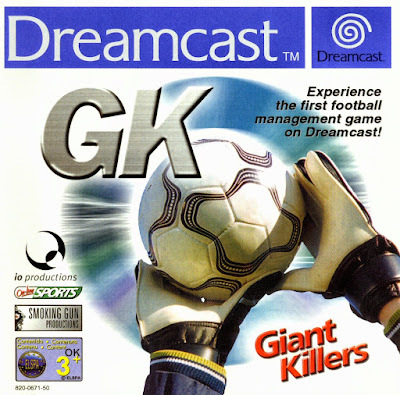 Giant Killers was also created by io productions. Was it always only intended to be a PAL only release? And are you aware of the highly collectable status of the game now? I had very little to do with Giant Killers - we worked in conjunction with Smoking Gun for that I think. 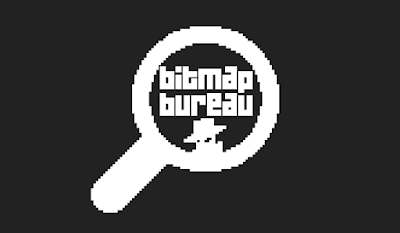 I did do a few minor graphical tweaks on it, but nothing of any significance. I had no idea it was so revered! Yes, it's one of those PAL exclusives that seems to fetch a pretty penny these days. Going back to Stampede though, can you recall why it was eventually cancelled? Was this a surprise to you? Infogrammes went through at least two internal reorganisations whilst we were working on Stampede. They never quite new what Stampede was (action, adventure, sim?) and when they finally ended up with their internal 'labels' (sport, action etc.) we just didn't fit into any one of them. The last few months were arduous and our producers at Infogrammes did try to do what they could to ensure the game continued development. In the end they were looking to move away from a traditional farmer and dog and ideas included replacing them with an eskimo girl and a wolf, or an alien and a his robot sidekick. Interestingly these ideas would have led the game down a more abstract path and made it closer to Nintendo's Pikmin, which would launch a few years later. It wasn't really a surprise that we were cancelled, just a let down. It was great fun working on the game. Having said that, if we had continued then we undoubtedly would not have started mobile development for Nokia a short while later - something which led on to a very successful venture with our second studio, IOMO. What are your enduring memories of Stampede? Do you think it could have been a success if it had been finished and commercially released? Whenever I see Stampede running (the last time would have been about 5 or 6 years ago) I still marvel out how unique and compelling the game is/was. 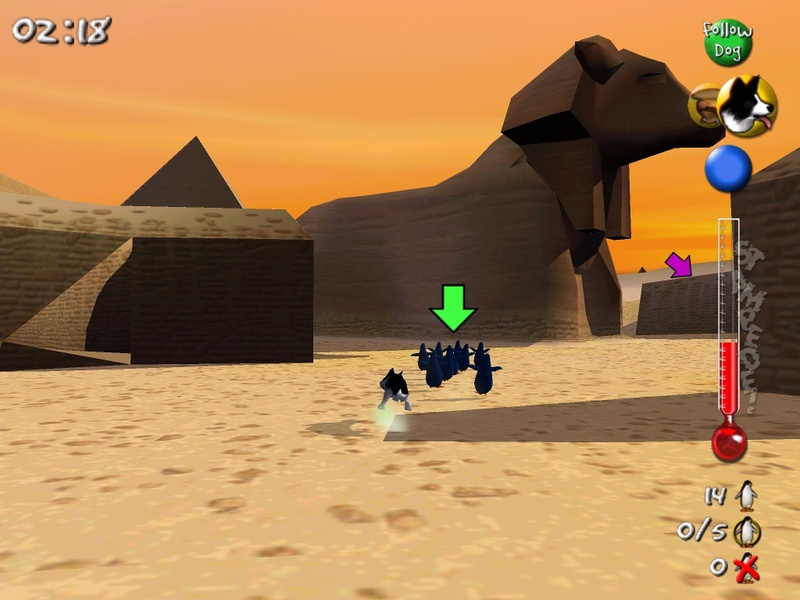 The engine (developed by James Sharman, now at Climax) was technically accomplished, and the game certainly looked great for the time. The art was mostly defined by Steve Wadsworth (scenery) and Paul Charisse and Cameron Kerr (characters). I was proud of the Zelda inspired user interface, too. 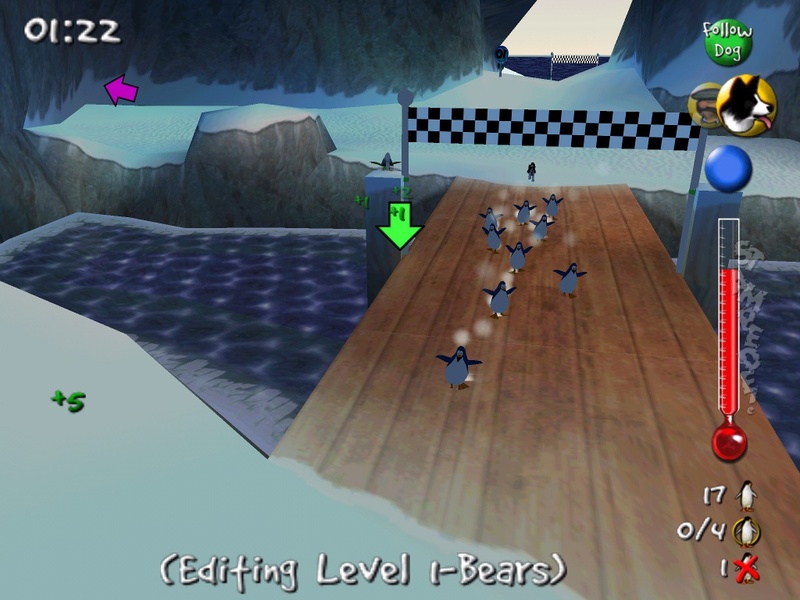 The game was genuinely fun to play. I strongly believe that the foundation for a good game is a solid engine with a compelling, tactile control system. I had worked with James prior on SWIV 3D for PC and we took that approach there, successfully. It's interesting that we may yet get the opportunity to sample Stampede if your former colleagues at Bitmap Bureau can get the remnants of the game running on a Dreamcast. Can you recall any other tales from 'back in the day' and your time working at io productions? Some time into development Paul Charisse became obsessed with the Lord Of The Rings movie trailer. He paid for Quicktime Pro so that he could download and rewatch the .mov file and dreamed of what the final film would be. A few weeks later he asked if we'd mind him sending his showreel to Weta. Our loss was Peter Jackson's gain and Paul went on to be part of the animation team who realised Gollum. He's back in the UK now, lecturing at Portsmouth University and working on a feature film of his own. One element of Stampede which was quite groundbreaking was the soundtrack. Paul Zimmer (who runs ZAP! - Zimmer Audio Production) created music which would dynamically reflect the action. The music would seamlessly evolve based on the events of the game, time limit, danger, location of enemies etc. Nothing unique by today's standards but in 2000 this was a new concept. I still think about our Farmer and his faithful friend (for some reason he was named Farmer Blow - nobody knows why) and the little town where he lived (Glendale - that was named after me!). 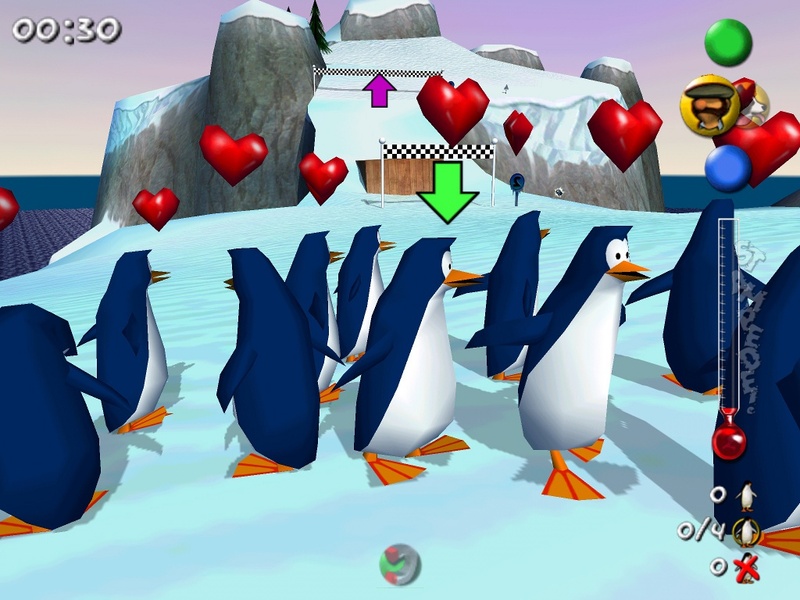 We built a small airport level which would act as the hub for the game, with Blow receiving alerts about where the next adventure would be - whether that was herding elephants in the Arctic, giraffe in the Wild West or Penguins in Egypt. He was a sort herder-for-hire and it just so happened that there was some global catastrophe that was leading to animals being relocated unexpectedly. I wonder what he's doing now. Probably sat by his fire, smoking a pipe with Shep curled up by his feet. Our thanks go to Glenn Broadway for speaking to us about Stampede, and to Nick Reed for documenting his experiences working on Stampede at his website. We also extend our thanks to Mike Tucker of Bitmap Bureau for giving us the heads up on Stampede in the first place, and also that a Dreamcast ISO is his team's possession. 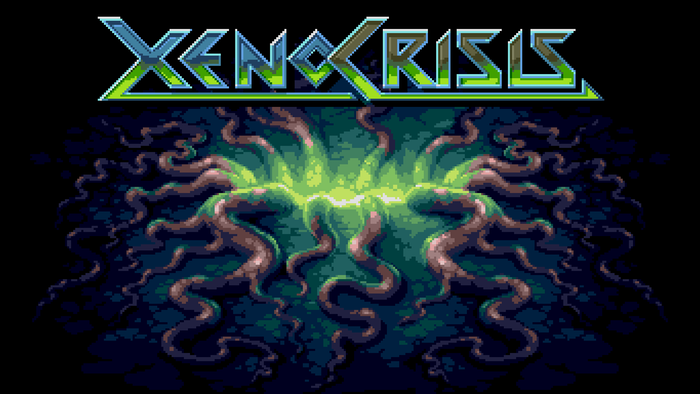 There's a totally credible chance that the code Bitmap Bureau currently has is fully playable on a Dreamcast, and once they have finished bringing pixel art sci-fi shooter Xeno Crisis to life, Mike assures us that Stampede will be fully investigated. If Farmer Blow and his trusty hound Shep are destined to finally make an appearance on the Dreamcast, we'll be sure to let you know. 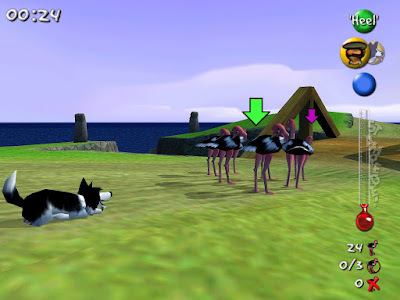 Would you like to see Stampede finally released on Dreamcast? Are you a sheep farmer who feels robbed by Farmer Blow and Shep's cancellation? Let us know in the comments, on Twitter or in our Facebook group. The graphical style reminded me of Space Station Silicon Valley. Is that a bad thing? I don't think so and it goes well for Stampede. Thanks for taking the time to speak to me about Stampede. It was a great project to work on and a shame it was never finished. It would be great to see it resurrected one day! Hope a release of this fun project will come soon. even if the game is not complete. thanks for your input Glenn! I too have fond memories of Silicon Valley on N64...not that I ever got anywhere near to finishing it! Wow this looks like such an interesting concept! I would absolutely love to see it completed one day, or at the very lease an unfinished build released if it doesn't come to pass that it is feasible to complete the game. 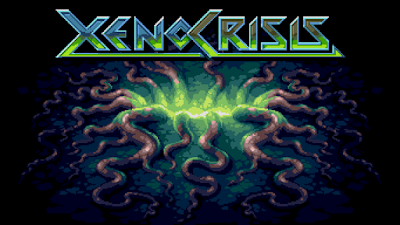 I guess the stars would have to align to make it happen, but imagine this game developed with the official SDK on a real devkit being released as an indie game. How great would that be?